I just love my new fitted tablecloth. It fits perfect and you can see the beauty of the rest of my oak table much better. Thank you for sending me the flyer that I ordered from. In fact I am planning on ordering another one soon. The table cover fits perfectly my patio table! Looked at other sites on Internet for this tablecover and the prices were double. Will buy from Walter Drake again. Nicer than the other color I used to buy. Better choices. Great cause protects my dinning table that I have for 16 years. I really like this tablecloth for the main reason that it reminds me of my childhood. It fits perfect on my odd shaped table. 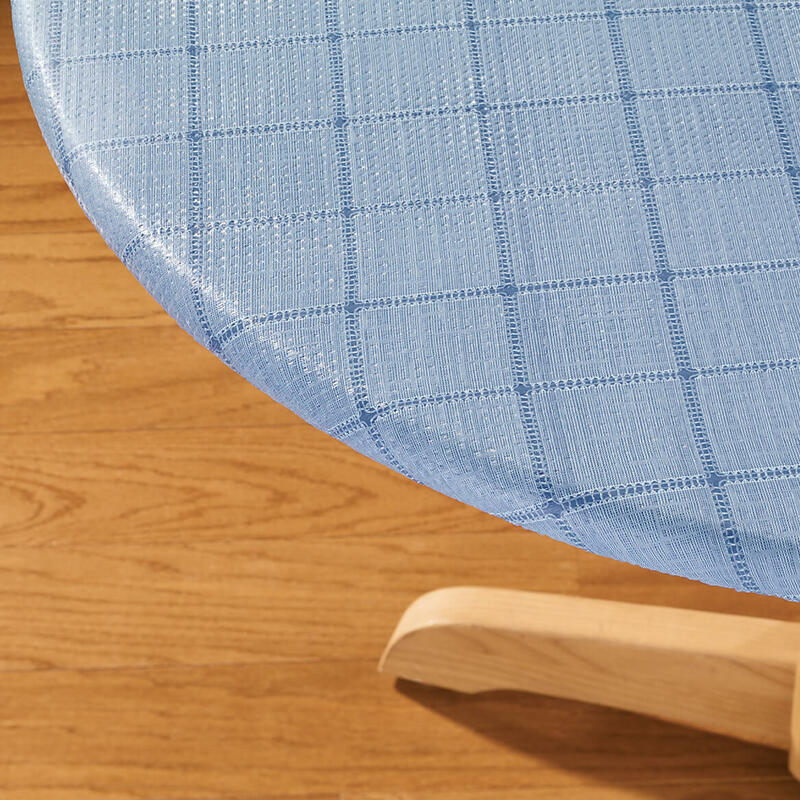 I bought the table cloth because I have a small child that is a very messy eater and the solid butcher block table was getting sticky and hard to clean. Since I started using these, my clean up time is cut in half and the covers have stood up to my child banging and pulling on it. 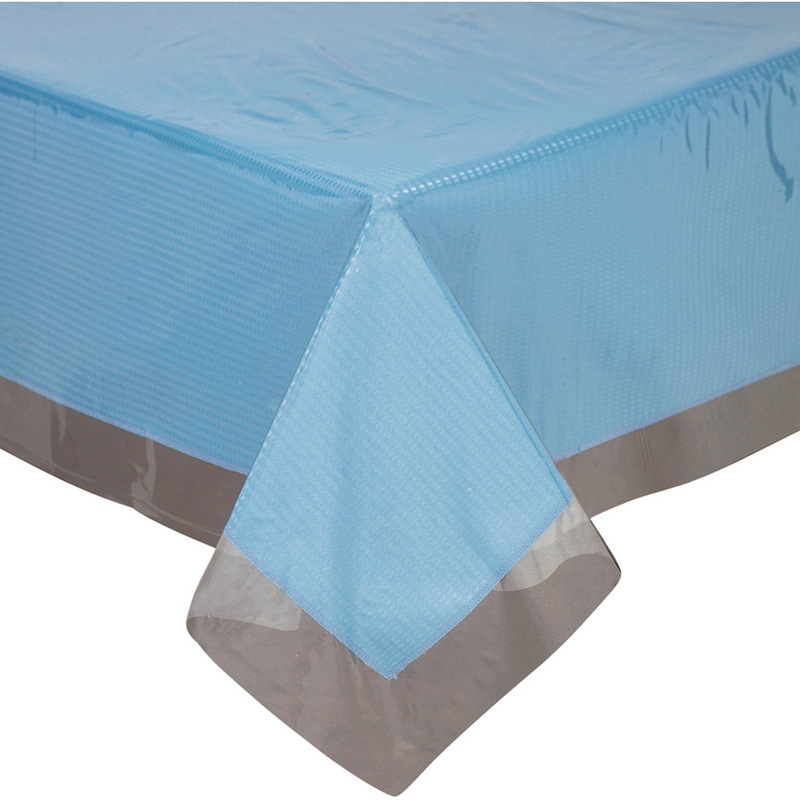 This product is just what we needed, it's the right size to cover the table but it doesn't slip and slide around thanks to the elastic. So far we love it. It fits my Patio Table perfectly and looks great. I have used these table cloths for along time. The table cloth always stays in place never fades my table looks great all the time. 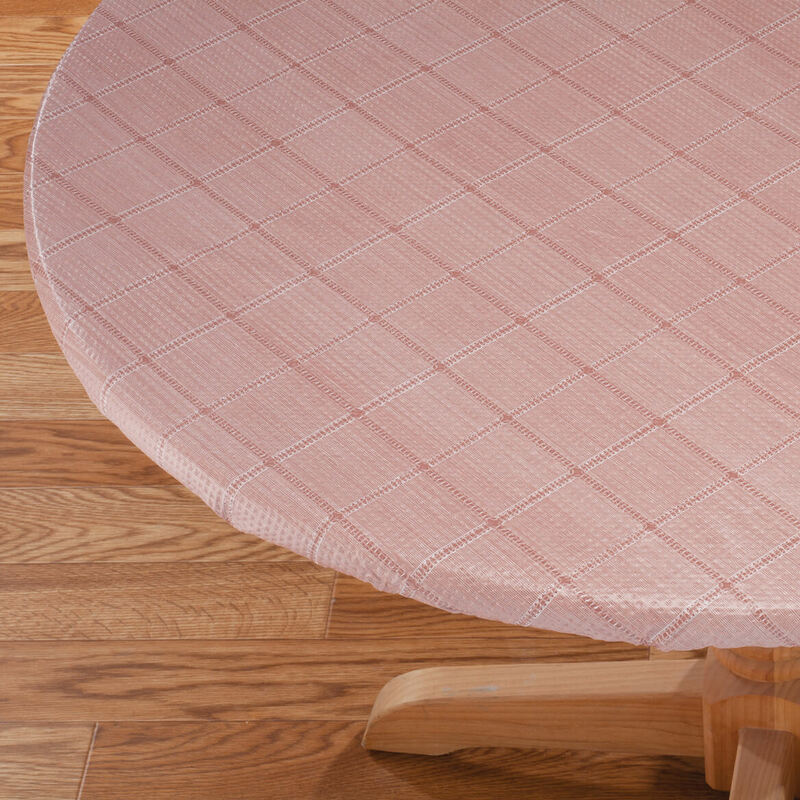 The table cloth is used under a nice top Table cloth to avoid any accidents that might happen to the wood surface. 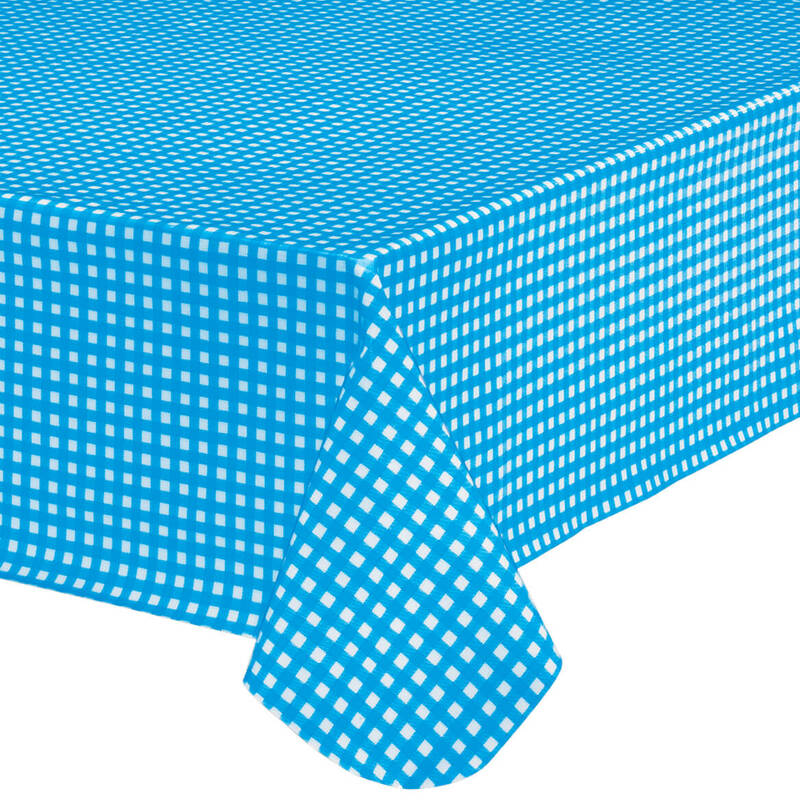 Finally, a product that solves the age-old delimma of pulling tablecloths, slipping table cloths, and yet one does have a table cloth on the table by using an elasticized table cloth. Will be back for others. Wished the plain colors would have had some other patterns and more options for printed ones. I covered a table on my screened porch which is on the beach side of our house on a barrier island in NC. I removed it for the off season but, so far, it's been great. Furniture takes a beating being so close to the ocean and this has been a great item to extend the life of our table. love it! i've been buying these from miles kimball for nearly 20 years now. 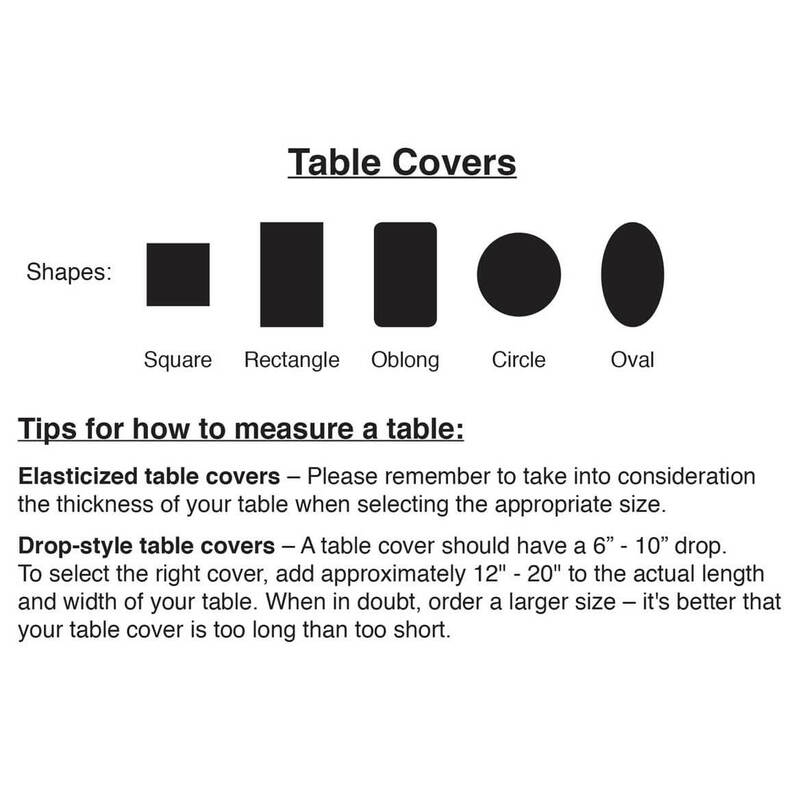 if you're buying any of the fitted tablecovers for an OVAL table, make sure it doesn't say "oval/oblong" in the description. otherwise you'll end up with an improper fit with extra material all bunched up in the corners. my table is oval and this one fits great! These covers are great, I get them for everyday use and for holidays, fits great on glass table, washable and reuseable they are the perfect fit for round tables. This is the second time I bought this, they last a long time. The other one I had for over 2 years and I have 7 year old twins . Used everyday on glass kitchen table. Easy to clean looks great. Love the design has a nice formal appearance. Use the second one in the sunroom over looking pool that is where we dine in the evening. Very happy with both. I use it as a family, daily used tablecloth. It wipes up really nice and is ready for the next meal. It has a nice, thick flannel backing on it. I love these tablecloths. They stay on the table, protecting the wood. I have a round one for everyday, and a larger oval for the extended table when family comes over. I wasn't sure when i ordered this table cloth if it would fit or even if it would work out. I LOVE it! Am so pleased at how well it fits & the nice look of it on the table that i am ordering more. I keep it on the table under my fancy table cloth & centerpiece. Then at meal time i take them off & we eat off of the elastic table cloth. Clean up is easy- just wipe it off. Return the dressy table cloth over it & put the centerpiece back - how easy is that! So far i have not put it in the washer so don't know how that will work out. My friend came for dinner the other night & is ordering one because she liked mine so much. Didn't think it would fit well on my 45" table. It fit over the 1 1/2 " thick top, and over the 2" apron. Looks great. soft sage color. Don't leave in dryer for more than 30 seconds. That's all it took to take out packing wrinkles. Have used this type cover for several years. Perfect for my glass top table. My 2 year old granddaughter can better see the edge of the table better & doesn't bang her head. Much easier to keep clean. I love these table covers!! I would buy this product again for certain! It fits my table perfectly! love the tablecover, before i was constantly moving the cover to recenter it after the children leaned on it. Now I no longer have to do that. Much easier to clean because it stays in place. It has held up well, and we wipe it with magic erasers and bleach towelettes. When I opened my plastic table cloth it was quite wrinkled. I put it in the washer with a few towels and then in the dryer for about 10 minutes and it came out perfect. Fits nice. I an even use it on my dining room table. Soooo many pretty patterns and colors to choose from. A definite winner. Don't hesitate to get one (or two or three). Great for outside tables in sunny CA. Elasticized Table clothes are GREAT! 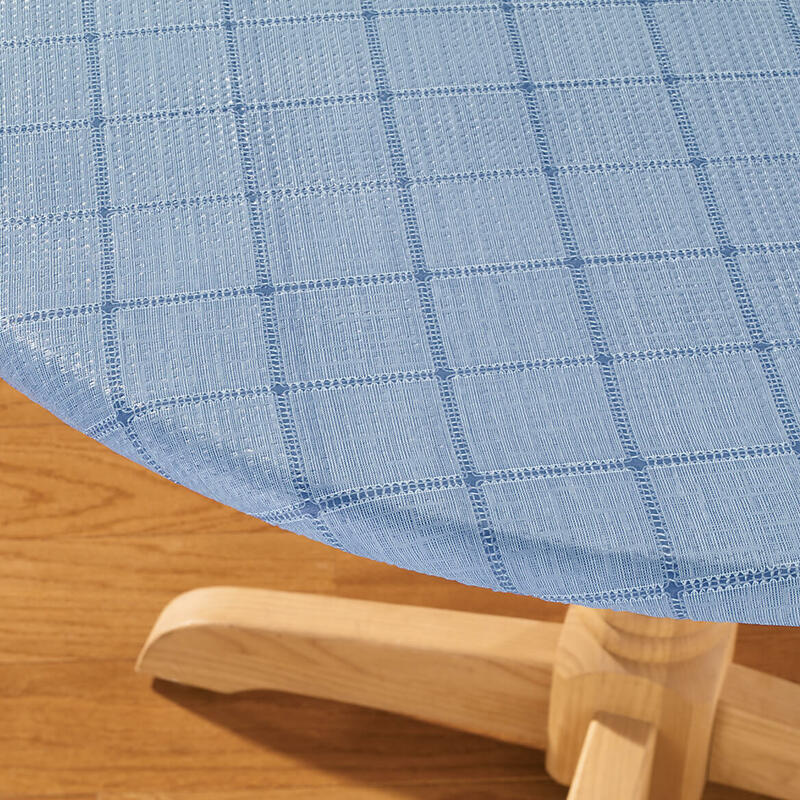 This table cloth STAYS on the table with no problem! This is the second one I have purchased and love it !! Wears well. Lasts a long time. Easily wipes off and a tight fit. Looks VERY attractive in kitchen. Fits the table really will !! Ieould buy this again I love how fits the table. Protects table love to use to play cards on. I have been buying these table cloths for years, they fit my oblong table perfectly. Ion gave bought more than one! I originally got this table cloth to protect my table, and I dudnt want it ganging down for my little ones to get hung up on or for them to pull across the table. It is easy to put on, very easy to clean. Just wipe with a damp cloth! I was able to chose a color that fit my decor. It is vinyl, so with little mishaps it dues get picked places or small rips. Over all it holds up well. I just bought my second one in nearly five years. I would recommend this table cloth to anyone. Needed a tablecloth to fit snug on my table. This does the trick. It's pretty, easy to keep clean. Holds up well (except for one small tear 6 months later). Would highly recommend this !!! And the pattern looks great ! I bought this item the first time at Christmas to use on the patio table. I Love it! The wind and snow etc didnt faze it one bit. So I bought a summer pattern. I am looking forward to enjoying this right thru summer into Christmas again!! I bought the rose colored tablecloth and it's perfect. My previous tablecloth kept slipping off the table; this one fits perfect and never moves. When my daughter spills something, the mess is easily wiped clean. This tablecover fix perfect to my table. I bought this to cover my aging patio table. I absolutely love this tablecloth. It was easy to put on and stays in place. Again, love it!!! 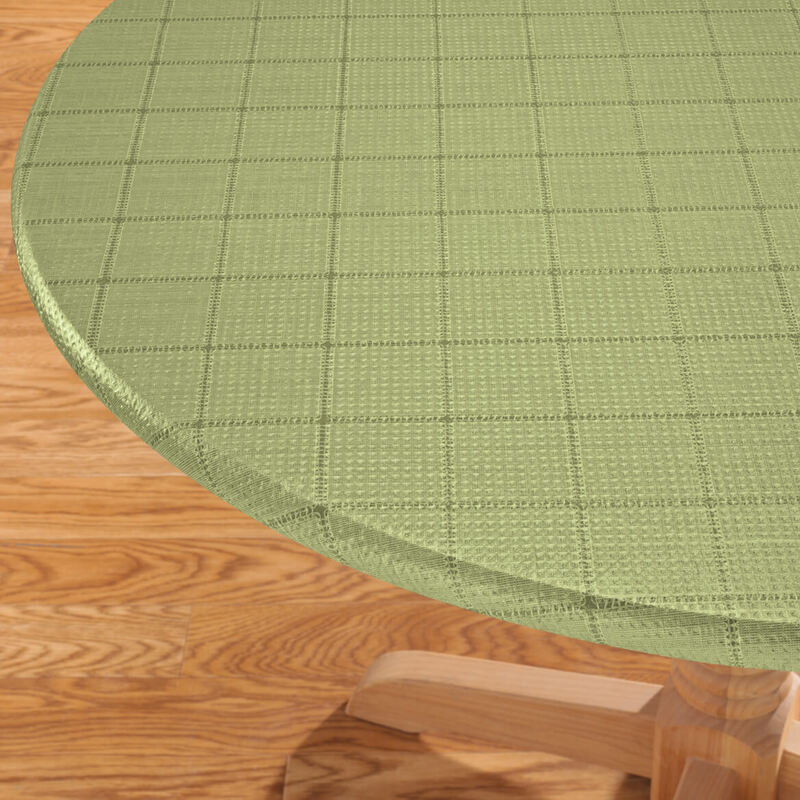 These fitted table covers work great with the grandkids. They stay on and hold table pads in place. There are no ends hanging down for toddlers to grab!! I have purchased several outside tablecloths from W.D. and use them seasonal. I am very happy with all their products. So far, I have no compaints. The price/value ratio is off the chart! I use this on a table that I don't want scratched or damaged when I have company that are not very careful. I like this table cloth, fits my kitchen table perfectly. I have been looking for a fitted table cloth in all the stores and can not find a one. Saw these at kimball, like the large selection of fitted table cloths. I am very please with this one, it looks like a real table cloth and clean up easy, just wipe it with a wet cloth. Well fitting versatile tablecloth cover. The elastic makes it easy to keep on. The sage color was lighter than in the picture, but still usable. I plan to order another color later on. Love this table cover,will buy it again. So far I like the product. If it stands up to wear I will definitely order it again. 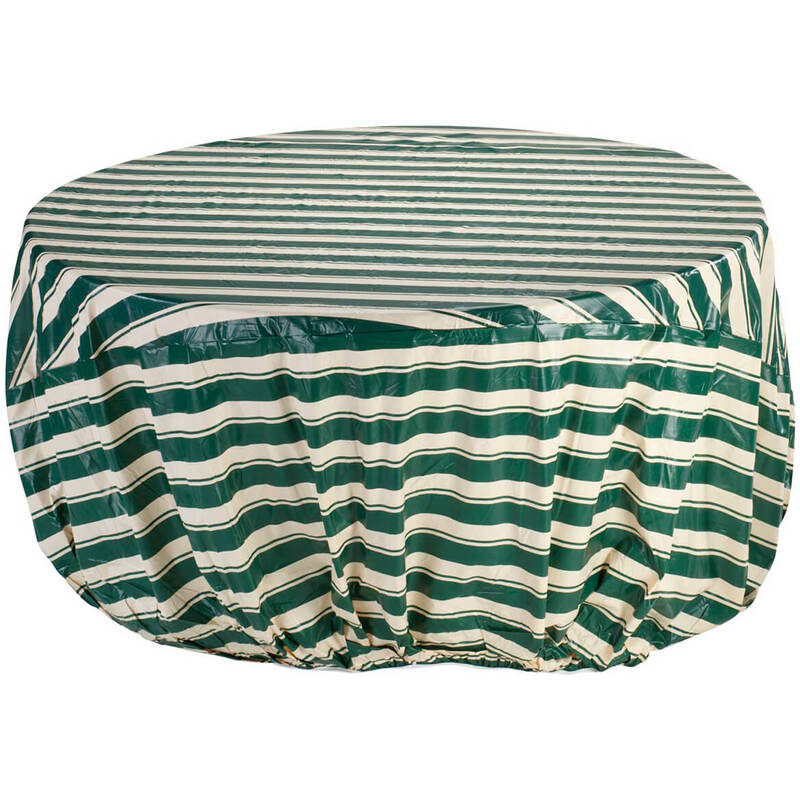 Regular type tablecovers tend to hit just against the lower body and can be uncomfortable, especially in the summer. Using for our patio table which works out great. Like how the tablecloth looks like cloth! 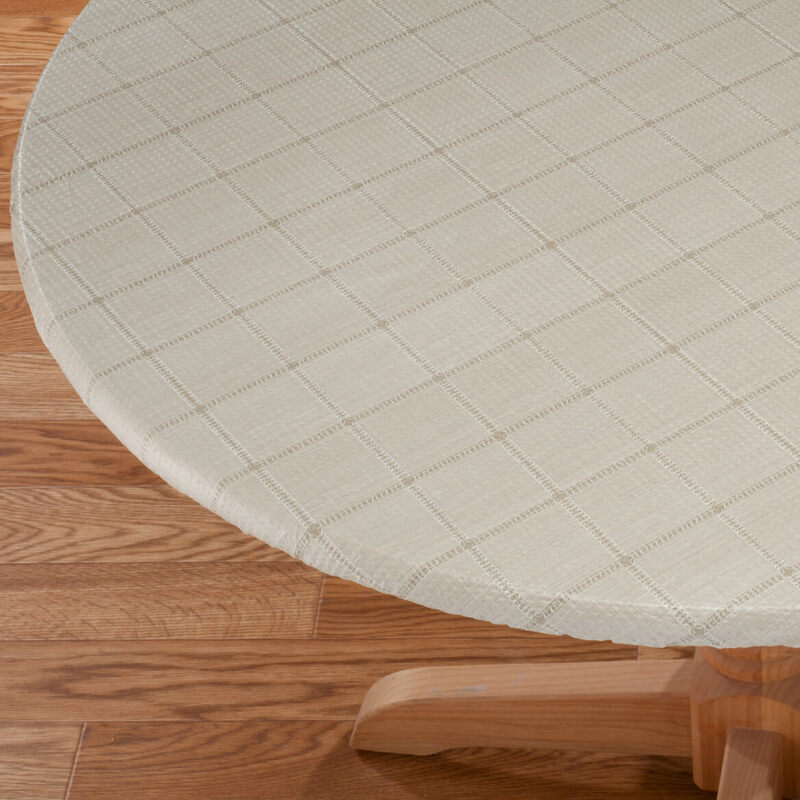 I have several of the round elasticized table clothes that I put on a round table where we play cards. 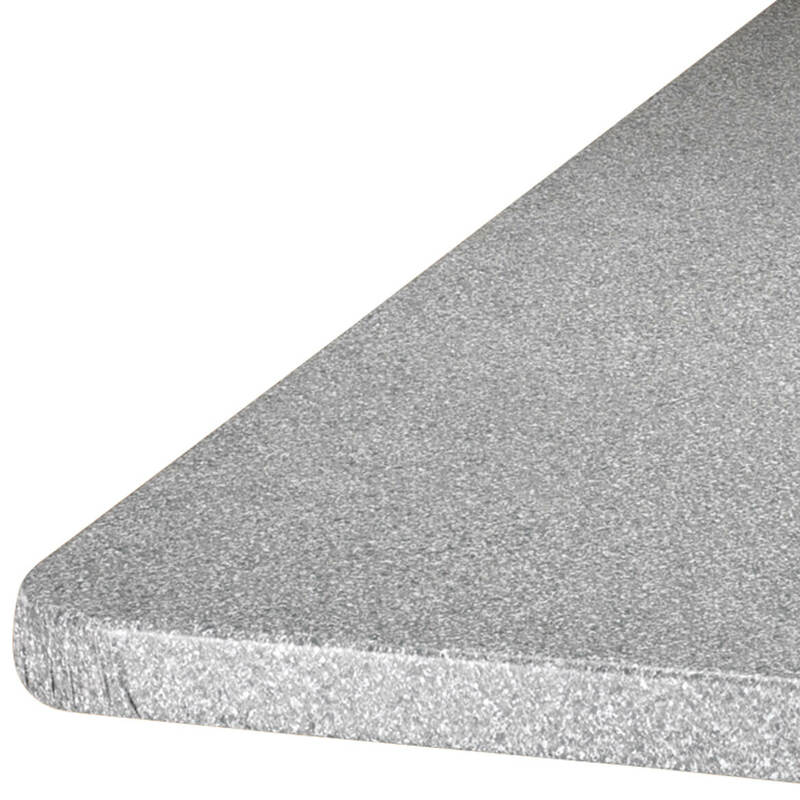 Creates a wonderful surface for game activities. Just wish you had the elasticized in rectangular sizes. Several friends have started buying them for their table now. Have used this tablecover and others like it for years. Lasts a reasonably long time, cleans up well, and covers a tired old table. The first table cloth sent was sent in the wrong size, it was replaced promptly with the correct size. THIS IS OVER MY WOODEN TABLE TO PROTECT IT... I CHOOSEE A LIGHT GREEN TO MATCH MY KITCHEN. This was a nice design and I really liked the color. I have owned quite a few of these and they are great for protecting my table and also a change of color now and then. The table covers have been put on tables in our community room in our senior subsidized apartment building where we hold various functions. 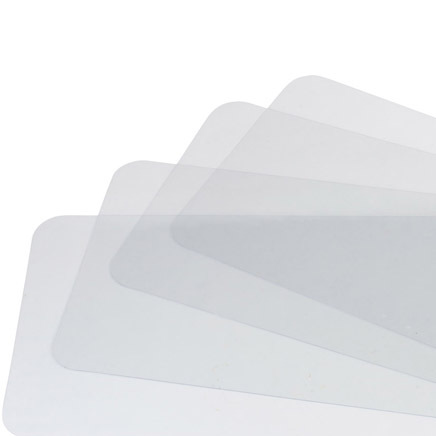 They are easy to wipe clean, they stay on the tables and do not slip off. Good for meals, card games etc. Just have to be careful with sharp objects because they are plastic and will cut fairly easy. Elasticized table cover fit perfectly. Table cover slipped easily onto table top. Was received wrinkled, but put into low heat dryer with wet towel and wrinkles disappeared! Yeah!!! Well made, nice spring color. Does not completely smooth out. I do appreciate the flannel backing and the ease of appying this product. I have ordered several others in different patterns from you over the years. And will probably order again, if I see a color or pattern that I like better. Very nice, this is my second purchase! Used daily to protect wood table. I am still waiting for replacement ? Use this for outdoor tables in sun and weater during season. Too much texture for my family. We have this table cloth on the table we eat at every day. I should have chosen a cover with a smoother surface. My children's sticky food is difficult to wash off of this surface. Doesn't fit my 42" round table snug enough. Might fit over a thicker table as the next size up would be a 48" table and then the cover would be too small. I like the color and design, but it arrived very wrinkled making it undesirable to use without another tablecloth on top. I had hoped to use it as a table covering when I have children over. I have been looking for a table cover for my 42" round table. Your company stated it was 40" to 44" in the ad. I assumed it was the table covers measurements. When received, it's was labeled on the package as 48" to fit a 40" to 44" table which left it loose on a 42" table. If it had been advertised as it was on the package, I would never have bought it. I have an old oak table measuring 45" round that needs refinishing on the top, but until then needs to be covered up. Tired of cloth covers that keep slipping. So I was very happy when I saw this product on line. [...]. And the cover is very thin, think shower cap from the dollar store, and "soft backing" - not so much. Still would have been OK if it fit, but it was WAY too big, so was EXTREMELY loose. I doubt the zillions of wrinkles from it being in a package will ever come out so it might look as nice as the picture. Realistically, I don't know how a cover, which should be snug, COULD fit any table from 45 to 56 inches properly, but I was hoping. Our A/C was on and the cover was so loose air was going underneath it and it was flapping in the wind like a descending parachute. Tried setting a heavy centerpiece on it which held down the center, but the rest of it kept flapping away. Great concept - but this idea needs improvement. Little thicker backing would be nice, and maybe having a drawstring on it like ironing board covers have would make it a usable product as maybe then you could tighten it to fit. I ordered the large table cover and you sent me the small. I didn't send it back because would have cost me more than the table cloth was worth. I have one and my friend loved it, so I’m ordering her one. These are the best table cover. Love them. I have an oval kitchen table and these tablecloths fit it best! Loved it...but the squirrels ate it! Had one of these before and loved it. It lasted a long time. Like that it is a 'fitted' tablecloth and don't have to worry about adjusting it every time you get up from the table or clipping it to the table. I love the elastic table cloths. I need them and they were affordable. It was just the right color and there was no need to look any further. I've previously had both of these tablecloths - they fit well, nice colors and go with my décor. They also hold up well with everyday use! My friend saw my tablecloth and she loved it....so I’m ordering one for her. I love fitted table cloths...Always stays in place, very neat...Hoping pretty solid colors become an option. Chose this color to switch out with a wood grain tablecloth. It is for my mother who had a very similar color and style previously which she liked. I like the neutral color and simple design. Not plain, but not too fussy. It is for our glass deck table which has seen better days cosmetically, but is still functional. We bought the "celery" one for our wood dining table. My husband made a clear glass topper for it, and we wanted a colorful, non-draping cover that matched both our everyday dishes and good china. Been using these tablecloths for years and I love them! My previous elasticized vinyl cover from W. Drake has looked nice for a few years. I liked this new pattern. I picked these Table Cloths because I have gotten them before and they are really nice - fix good and great color. Unable to find this size table cover anywhere else. Like it for my other table. The light sage looks white, is that what it is? I bought the celery color and its light green. Very pretty! No-it was sage or celery in color. How do you get wrinkles out? BEST ANSWER: I put the table cover in the dryer on low heat for a few minutes and kept checking it to make sure it didn't get too hot. A few minutes took the wrinkles out. does this come in a 60inch round? BEST ANSWER: Thank you for your question. No, it does not come in a 60" round. We hope this information will be of help to you. will this snung on a 52" round glass top table? BEST ANSWER: Thank you for your question. Yes, it will fit snug, any excess will be under the table. We hope this information will be of help to you. 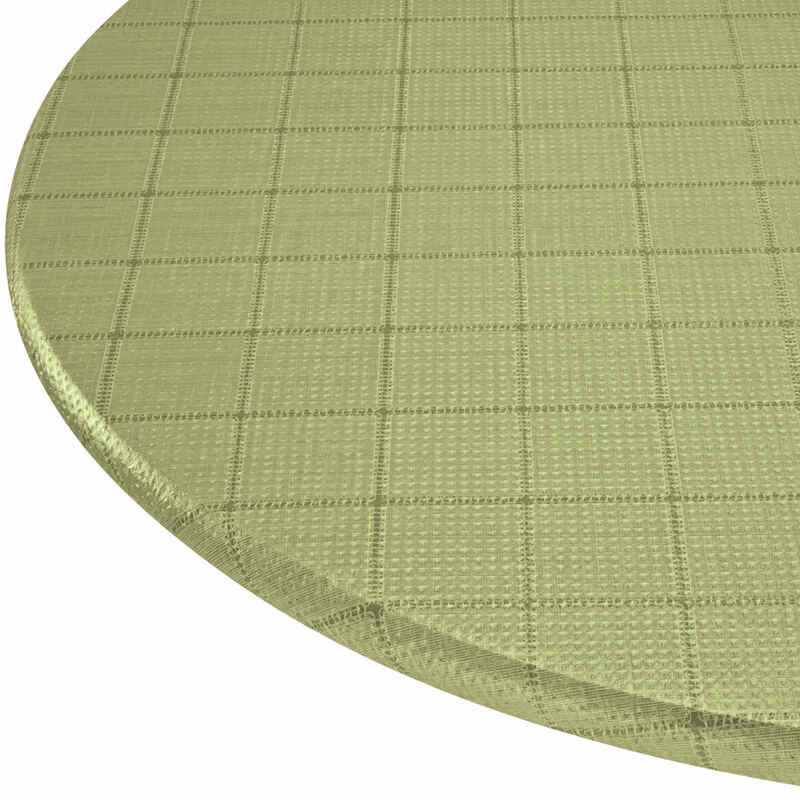 tablecloths for 72 inch diameter round tables? BEST ANSWER: Thank you for your question. Unfortunately we do not carry any 72" table covers. We hope this information will be of help to you. WILL YOU BE GETTING ANY ROSE COLORED TABLECLOTHS IN SOON? BEST ANSWER: Thank you for your question. We are always getting new items in, we suggest you visit our website occasionally to check. We hope this information will be of help to you. BEST ANSWER: Thank you for your question. Unfortunately, we do not have a table cover for a 60 inch table. We hope this information will be of help to you.